For many years mechanical and structural engineers have been looking for ways to create light-weight but durable and fatigue-resistant load-carrying structures. Topology optimisation methods now allow engineers to fulfill their idea in the best possible way. Topology optimisation uses mathematical algorithms to get a design which exhibits removed stress concentrations and the lowest stress levels for a given amount of used material. This process is driven by prescribed support and loading conditions acting on a structure modeled with a given material. In this way the engineer can obtain the best possible design fulfilling its mechanical requirements. Topology optimisation tends to create organic geometry, if adequate technological constraints are not imposed by the engineer. Such designs are often impossible to manufacture by the traditional methods but typically exhibit excellent mechanical properties. 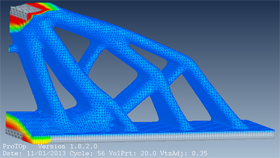 To make most of this, ProTOp is equipped with unique and advanced configuration tools which enable a usual solid FEM model to be turned on-the-fly into a combined solid/shell/lattice structure and optimise it immediately without doing any extra CAD work. When finished, ProTOp offers smart export capabilities to smooth and export your design in a form convenient for a 3D printer. ProTOp is a standalone software package for topology optimisation. It is based on its own specially developed FEA solvers containing only high-performance and fully parallelised code. ProTOp takes as input FNF or INP files, generated either by PTC® Creo®, Simulia® Abaqus, or SolidWorks® Simulation. ProTOp has a user-friendly and fully interactive interface enabling the engineer to monitor and influence optimisation progress as desired. Using ProTOp, the user can address two topology optimisation objectives: either strain energy minimization to get lowest stresses or lowest eigenfrequency maximisation. View animation below (click on picture) for an animation of a ProTOp optimisation of a support. For more animations go to: http://caess.eu/site/Software-Animations.html. ProTOp 5.0 has a completely renewed software engine and user interface. The user interface is much more intuitive with more preview capabilities. Also new tools are added. 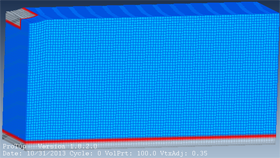 For example a tool to create a localised mesh refinement which results in even more accurate results. Also the model preparation is easier than ever. Improved smoothing and export tools result in much smoother models and therefore easier to process.